Visva Bharati has two main parts. Srineketan and Santiniketan both are consistently called Visva Bharati. The towns and the university are situated not too far away from the river Kopai which flows to the south. Gurudev Rabindranath wished that his sons take the responsibility of sriniketan and they also take the responsibility of the school of Santiniketan. In the second half of his work, development of Srineketan was started. With the help of two foreigners, Elmherst and Dorothy Straight Agro-Economical Research Culture of Surul house was started. On 1922, 6th February “Surul Ferm” was established. Now it is known as “Department of Agriculture – Santiniketan. In 1921, 22nd December Visva Bharati Society was established. 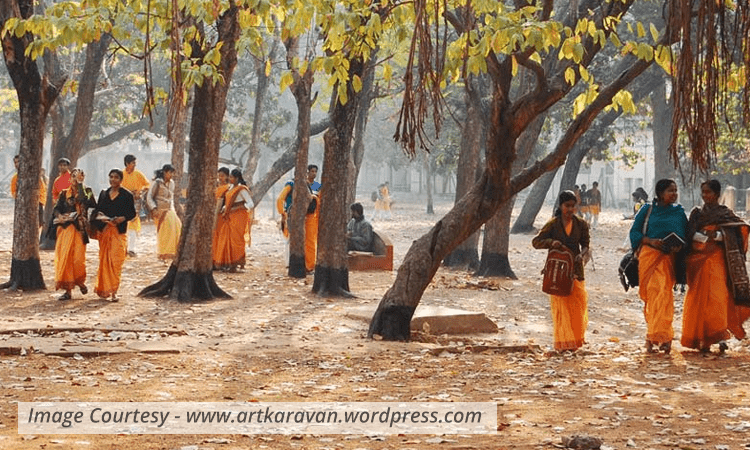 According to the rule of the society, Santiniketan and Srineketan Samity was also constructed and known as “Santiniketan Karmasamity” and “Surul Samity”. Elmhurst was the director of the Surul Samity. In 1923, 26th December Visva Bharati first used the name “Srineketan”. Gurudev Rabindranath Tagore tried to show the whole world through his Srineketan, that he had achieved one out of his two aims in life. How or when was it fulfilled he didn’t know. In the beginning period, there was a crisis for everything.But the darkness removed gradually. Elmhurst helped Rabindranath Tagore to fulfill his dream work. Rabindranath Tagore said “He made his place as an independent working field… Alone I could not take the responsibility of India. Only I could develop one or two villages from darkness, superstition and built an ideal place. In the beginning the Sriniketan project work, it didn’t start with well-planned way. At that time all the works were done by “Srineketan Samity”. It consists of 16 members. Rabindranath was the chief secretary of this Samity and his son Rathindranath Tagore was the working secretory and Devendra Mohan Basu was the finance secretary. Except them, Charuchandra Dutta, Gour Gopal Ghosh, Dhiranando Roy, Dr. Jitendranath Chakraborty, Nepal Chandra Roy, Dhirenmohan Sen, Premchand Lal, Hasim Amir Ali, Dr. HG Timbers, Bishwanath Chattyapadhya etc were taken responsibility of Srineketan Samity.